Ex-immigration minister insists he can win. Conservative leadership candidate Chris Alexander laughs off the suggestion that he’s a hard guy to read. “I’m in it to win,” the 48-year-old tells The Huffington Post Canada over breakfast at The Fairmont Macdonald in Edmonton. It’s the morning after the would-be leaders’ debate, and Alexander is looking relaxed. His hair is wet from a morning shower. He is wearing blue jeans, a light blue cotton shirt, navy cotton blazer and light brown suede shoes. He’s sipping black coffee and has just had an orange juice. He chuckles when asked why he is running — he was just roundly defeated in the Toronto-area riding of Ajax 15 months ago. Alexander orders the Macdonald Benedict: two soft poached eggs on English muffins with Canadian back bacon, hollandaise sauce, heirloom potatoes, roasted roma tomatoes and sliced fresh fruit. He asks for his eggs to be poached soft. It was difficult on his young family. He and his wife, Hedvig, have two daughters, Selma Zolaykha (born in 2009) and Elisabeth Malalai (born in 2011). He wondered if jumping into the leadership race made sense for them and whether he wanted to put everyone through that again. “But failure in politics is actually part of being a better politician,” he says. He worked harder in 2015 than he did during the 2011 race, he notes. “It wasn’t single-person combat that let us down or that showed our weakness, it was a national trend, and in urban Canada, we lost a lot of our altitude with new Canadians. We screwed up, we didn’t tell our story. “On social media, we were second rate, and those decisions were not made by us candidates out in the highways and the byways,” he says, as the waitress brings more coffee. Alexander, however, was one of the major faces — and more controversial figures of the 2015 campaign. Following the drowning death of three-year-old Alan Kurdi, Alexander appeared on the CBC showing little empathy for the growing refugee crisis and lashing out at the public broadcaster for failing to cover the Tories’ previous refugee intake with much fanfare. Then weeks later, he stood next to Leitch as they announced the Conservatives’ plan to establish a barbaric-cultural-practices tip line. Alexander dismisses suggestions his leadership bid is an effort to recast himself and rebuild his public image. “Listen, that was an unpleasant experience. That issue, that was fake news. It’s not about practices, it’s about forced marriages,” Alexander says about the Tories’ tip line. “It’s astonishing how many articles I can point to over a whole year and a half that don’t even mention the term ‘forced marriage,’” he adds. Butts is Prime Minister Justin Trudeau’s principal secretary and the main architect of the Liberals’ electoral win. He is, however, not responsible for the framing of the tip line. So, where is the fake news? “For a year and a half people have talked about this issue — Chris Alexander, barbaric practices this, barbaric practices that. They never mention, what the underlying issue is, which is women and girls in forced marriages,” he responds. "Failure in politics is actually part of being a better politician." The waitress arrives with the eggs benedict and Alexander takes a bite. What Alexander wants to talk about is his desire to build a Canada that is more engaged in international affairs. He envisages a country that spends more on its military, air force and navy, that contributes more to the North Atlantic Treaty Organization (NATO) and isn’t afraid of engaging in Syria. He believes Canada should be bombing the al-Qaeda affiliate in Syria and ensuring that Syrian President Bashar al-Assad’s air force can’t bomb his own people by grounding his air operation, and using Canadian special forces on the ground to help identify targets. Alexander also wants to aggressively court world markets in Asia, Europe, Africa and South America. He wants Canada to diversify its exports to ensure 50 per cent of trade is done outside the continent. He wants the Canadian Forces used to ensure the safety of marine trade routes and he wants to extend Canada’s diplomatic presence round the globe, using it to promote deeper trade. Canada needs to tell the world that it is the best place to do business, he says. He promises to slash payroll taxes on small businesses, reduce corporate income taxes (although he doesn’t say by how much) and invest heavily in mostly undefined large-scale innovation incentives. He wants to make it attractive for start-ups to stay in Canada and for companies, especially European firms, to set up a North American home-base in Canada. He wants to bring “deep tech” to Canada, from artificial intelligence and robotics to genetic engineering. He wants the new economy to happen here. It’s hard to see how Alexander wouldn’t make government bigger. He promises tax cuts and a lot more spending on embassies abroad, on active military missions and to expand the size of the army. While he pledges to repeal any carbon tax and build pipelines in every direction, he also says he wants “a larger CBC” mandated to provide more foreign coverage that fits with the government’s economic and political agenda. He wants to create an independent firearms agency to regulate guns and an independent procurement agency to purchase National Defence equipment, including “the best fighter jets” and nuclear submarines. Alexander wants to nation-build, like the prime ministers he most admires: John Diefenbaker, Sir John A. Macdonald, Sir Robert Borden, Brian Mulroney. Unlike most other Tory candidates, he has policy focused on ending homelessness (he would introduce a private sponsorship plan, for example) and on addressing problems on First Nations' reserves. If he were prime minister, he says, clean water and good education would be a daily focus for his government. Unprompted, Alexander takes a swipe at two of the contest’s perceived front-runners. Bernier “is not going to win.” His pledge to end all government subsidies is “obscene,” Alexander says, adding that Bernier would have a hard time pivoting from a libertarian platform to a forge a broader coalition. Alexander originally committed to run again in 2019 but he’s no longer sure. “It depends…. We’ll have to see who the leader is and so forth,” he says, adding some hot sauce to what’s left of his eggs. Alexander’s policy proposals haven’t attracted much attention. Perhaps, it’s because he has raised only $116,396 in 2016 from 230 individuals, placing him ninth of 14 candidates. Perhaps, it is because he has no endorsements from any of his old colleagues in the House of Commons. Perhaps, it is because Alexander continues to attract a lot of negative attention. He was criticized in December for standing by while protesters in Edmonton shouted “lock her up” as he spoke about Alberta Premier Rachel Notley’s climate policies. “Lock her up” was the chant used by supporters of then-Republican presidential candidate Donald Trump against his Democratic challenger, Hillary Clinton. "I was somewhat shocked, taken aback, mortified even, that this chant, this slogan, from south of the border was suddenly being picked up by everyone in front of me," Alexander told the CBC after the incident. "I as well find it offensive that people would be calling for illegal — even if some of them thought it was in jest — for illegal actions, threatening actions, against a sitting premier of Alberta." He was playing for time, trying to find a way to interject, he said in explaining his body language. As the chant wound down, he talked about voters using the ballot box to send a message to the premier. A week later, Alexander was in Calgary telling a group of Albertans that he had been warned by “a bunch of politically correct people” not to return to another rally in the province. There he led a “vote her out” chant. In February, with the backdrop of anti-Islamophobia motion M-103 being debated in Parliament, Alexander, along with four other leadership candidates, attended The Rebel’s “Freedom Rally” at Canada Christian College in Toronto. Organizers said the motion was an attempt to expand anti-blasphemy laws in Canada. Alexander took the stage to talk about freedom of speech. “Can’t be with you on that journey, but I support your freedom of speech,” Alexander responded. The Rebel rally took place only 17 days after a gunman killed six men praying in a Quebec City mosque. Alexander says he attended the protest in Edmonton because it was a rally for jobs in Alberta. “In Toronto, it was a rally about freedom of speech where I wanted to say, and did say, freedom of speech includes recognizing anti-Muslim hatred in this country is a reality. Islamophobia is a problem. We as Canadians stand together to oppose those things. “But what happened in 2012 in 2013? The Islamic State started to up its media machine, beheading people, conducting atrocities in full public view, and so some people, a worrying number of people can’t distinguish between a Muslim and the fanatic, the terrorists that are conducting these acts, and it makes them nervous. The waitress comes by to clear the plates. Alexander hasn’t eaten his breakfast potatoes. He orders a cappuccino. “Listen, I don’t agree with a lot of what these guys do, just like I don’t agree with what is on a lot of CBC but if I am invited to speak to, in Toronto, my hometown, to a meeting where basically everyone is a Conservative, oh yeah I would go,” he says, whispering now. The man in question is Maulana Syed Mohammad Zaki Baqri, an anti-Semitic extremist imam who, according to media reports, seemed to rub Alexander the wrong way after he bashed Harper. Instead, Alexander says, he told the crowd he disagreed with the imam’s message but supported his freedom of speech because if he had made a speech like that in Tehran denouncing the supreme leader he would be in jail. The forums he chooses to attend may be controversial but Alexander says he wants to be where the people are. Alexander always wanted to be a politician. 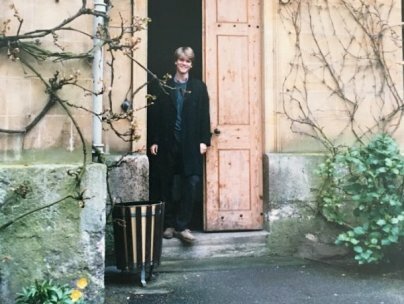 In high school, he dreamed of one day becoming prime minister. “Who didn’t?” he asks, with a smile. He was a bright student who benefited from an upper-middle class upbringing and the attention of smart giving parents who provided him with opportunities that helped him excel. Alexander was born at Toronto General Hospital in 1968. His mother, Andrea, was a high school teacher turned arts-and-culture volunteer. His father, Bruce, worked as a lawyer and later served as an assistant deputy minister for the Ontario government. He attended Oriole Public School, where he took Grades 2 and 3 together. At the quasi-private University of Toronto School, he did Grade 7 and 8 combined with the other students. When he entered McGill University, he was 16. In high school, he took German and won a provincial language contest. He was actively involved in model United Nations simulations, which piqued his interest in global affairs, and served as president of the student council in Grade 13. At McGill, where he earned a bachelor's degree in history and political science — “joint honours,” he notes — he submitted his papers and took exams in French. He served as the student council’s vice-president of external affairs and rowed. His accomplishments didn’t earn him the prestigious Rhodes Scholarship, which recognizes the top students and athletes with a grant to study at the University of Oxford. Governor General David Johnson, then the president of McGill, forced him to apply, he says. But not getting it was a blessing. He’d rather “not wear the stigma of Cecil Rhodes.” (Rhodes believed whites were the “master race” and the more of the world whites inhabited, the better it would be for humanity). After graduating in December 1988, Alexander moved to Quebec City to live with his cousin and attend a semester of university at Laval. He wanted to speak French. He was the only federalist in his class. He had written the foreign service exam before leaving McGill, and mid-way through his second BA at Oxford, the department called to offer him a job. He joined Foreign Affairs in 1991. Two weeks into his job as a desk officer, there was an attempted coup against Soviet president Mikhail Gorbachev. He had expressed an interest in the Soviet Union, having travelled to the region, visited East Germany on an exchange, and Czechoslovakia after the Velvet Revolution. In 1993, he was sent to Moscow as the third secretary and vice-council. Within a month of his arrival, Alexander was standing outside the Russian White House during then-president Boris Yeltsin's standoff with the Russian parliament. He remembers people falling all around him and running as snipers shot into the crowd. In 1995, he recalls meeting Vladimir Putin, then the deputy mayor of St. Petersburg. The two would go on to cross paths several times, with Alexander serving as Putin’s liaison officer during his G8 visit to Kananaskis. Putin, Alexander says, wanted to know where the “Indians” were. After a stint back in Ottawa as the assistant to the deputy minister on G8 issues, and as the deputy director of the Russian section, Alexander was sent back to Moscow in 2000 as the No. 2 person in the mission. Three years later, Ottawa offered him Canada’s top job in Afghanistan. “I hesitated for about three seconds.” He was an ambassador at 34. Two and half years later, Alexander, who had earned rave reviews as an extremely bright, capable, and active diplomat from army commanders and civilians alike, left the federal public service on a leave of absence. He is particularly proud of Canada’s involvement in organizing the 2004 presidential elections, and watching the long lines of women and men form early in the morning. Months after his arrival in Afghanistan, Alexander had also just met Hedvig, a Danish army captain working with the International Security Assistance Force. Their courtship was normal for the circumstances: their first date was at a Kabul restaurant with three fully armed Canadian soldiers standing guard as a protective detail. She later worked for the UN on elections and disarmament and ran two charitable projects in Afghanistan. In 2008, they married in Denmark. Alexander had been offered the senior civilian job in Afghanistan for NATO and a UN job as special permanent representative. He chose the UN gig and served from 2005 to until mid-2009, after the birth of his first daughter. Afghanistan was tough, especially after the international community “started losing.” During his time as Canadian ambassador, things were relatively secure, but then the Taliban rebounded. In 2010, Alexander wrote a book about his experience, The Long Way Back: Afghanistan's Quest for Peace. He is still frustrated the international community turned a blind eye at Pakistan’s involvement. When he would talk about support for the Taliban by Pakistan’s intelligence agency, the ISI, the Americans would tell him to keep quiet, that it wasn’t true. It’s one of his big regrets. He wishes he’d been more direct about an ally training and funding groups that were killing foreign soldiers. "I don’t have people beating their breasts and ripping their clothes off for me with passionate shows of support. But I find a lot of people say:'You're talking sense.'" After Alexander left his post in 2009, he headed to Denmark for a few months before coming back to Canada. He already knew he was going into Canadian politics. “Going back into the foreign service and being in a nice comfortable place but not being in the crucible of decision-making or in the political arena, it would have been boring,” he says. He had spoken to people in the Prime Minister’s Office, including Harper’s campaign manager, Doug Finley, who told him to find a Toronto-area riding the Tories could win that didn’t already have a candidate. For a few months, he lived in a condo downtown before he and his wife settled in Ajax. By late September, he was the Conservative candidate in that riding. Media reports at the time suggested Alexander had been courted by the Liberals as well, but he says those talks were never serious. After pounding the pavement in the riding for two years, Alexander defeated the Liberal incumbent Mark Holland. (Holland returned the favour when he bested Alexander in 2015). He was appointed immigration minister two years later. Under his leadership of the department, the government introduced Bill C-24, which stripped dual-citizens convicted of terrorist offences of their Canadian citizenship. Another Conservative policy that backfired during the 2015 campaign. This time though, Alexander hopes to build a less exclusionary tent. “I want a broader party that includes people like you and me, that includes a lot of Canadians,” he says. “This is a preferential ballot where people are still deciding not only who their first choice is but who their top three or four choices are, and it is not going to be easy for anyone to achieve the numbers,” he says. The Conservative leadership race will also be decided by a point-system that gives every riding equal weight in determining who the next leader is, regardless of size of the membership. “I don’t have people beating their breasts and ripping their clothes off for me with passionate shows of support. But I find a lot of people say: 'You're talking sense. We need these kinds of messages. An economic message that is well-rounded.'"